In a previous post I mentioned The Fox & The Crow in Fort Collins. They not only have great food, but also quite the extensive cheese selection. That means they also have non-cow cheese! Went in these to see what I could find to have as just a fun appetizer for a dinner. After some discussion, I was offered a sample of the Idiazabal, a sheep’s milk cheese from Spain. It was amazing! Just semi-hard and had a unique smokiness to it. Far too good. Had to be careful not to buy too much of it. Would also be perfect paired with some Pinotage! Had to do some quick research on it, as well. Did not know there is a cheese.com site… it confirmed my taste of smoke and gave me more info. Great stuff. Can’t wait to grab more. LAM Pinotage. A bit earthier than normal, some tobacco in there, had minimal leather and smoke notes, but very interesting. I tasted some fizz, but it was a ‘normal’ bottle. It was a VERY light red. Was definitely the most unique Pinotage I’ve tasted. About $20/bottle. I’m part of a Meetup group that is in love with wine and hosted an event last night with the theme — Ultimate Pinot Party. 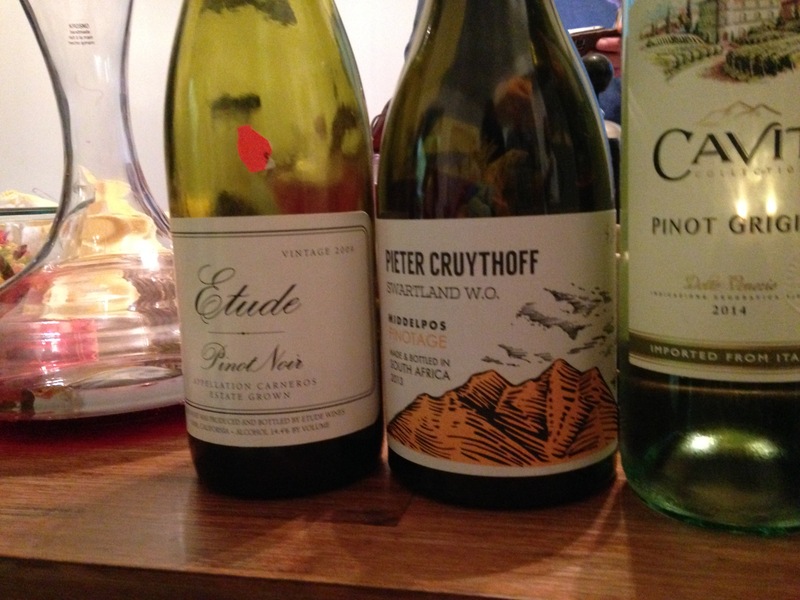 Guests had to bring a wine related to Pinot — Pinot Noir, Pinot Meunier, Pinotage, Pinot Gris/Grigio/Blanc, etc. There were likely a few others. Some of them were empty come the end of the night! Amazing to smell and taste the differences in vintages and regions, and of course varietals. Cheers! I think I’ll have them both, if you don’t mind. While enjoying a couple of the recipes I’ve posted recently, my friends were so kind as to bring over some great wine to pair with the food! So, of course we had to open them. One was simply masked in a nice Williams Sonoma bag. I pulled it out and could not have opened that bottle fast enough. 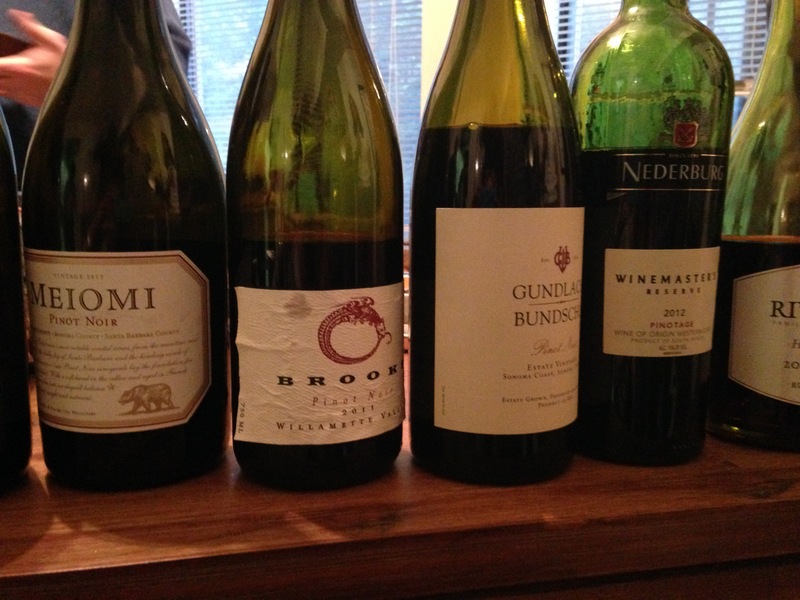 It was my favorite varietal — Pinotage, from South Africa, of course! Oh Pinotage, how I love thee. I was so happy it was a screw top to quickly open it. My only problem was that I did not have a (wine) glass at my fingertips. It was the Spier (Signature) Pinotage. It had very nice fruit to it, though it did not hold the traditional smokiness of Pinotage. It was light and had great character. Then we decided to open the second bottle to do some comparison. 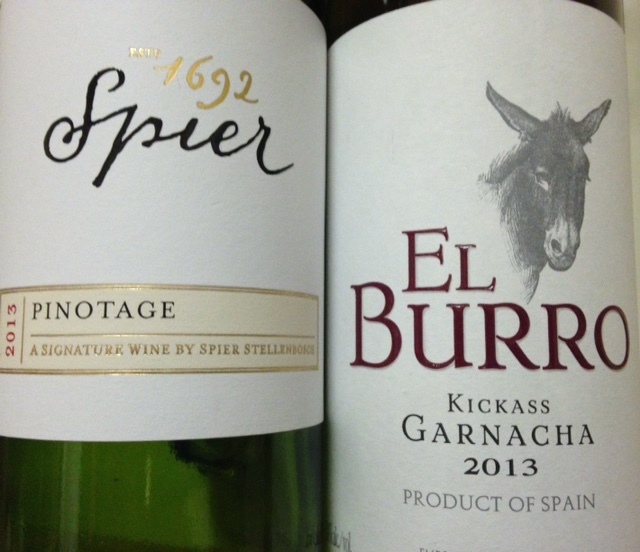 This was from Spain, the El Burro Kickass Garnacha. Love the name. And let me tell you, it lives up to it. The first thing I tasted was chocolate! There were also some berries in there. Nowhere did they mention chocolate on the label, but even having some the next day…chocolate, chocolate, chocolate. Amazing. It was a great evening of friends, wine and food. Can never go wrong with that. Pinotage is one of my favorite wines with that smokey nose and taste. Then, the subtle leather notes, as well. And, whenever I can find it in the States, it is always a bonus. Sometimes it can be hard to get, or you always find the same ones. So, when in CO the past week or so, I got totally different distributors than what I am used to in DC, MD and VA. 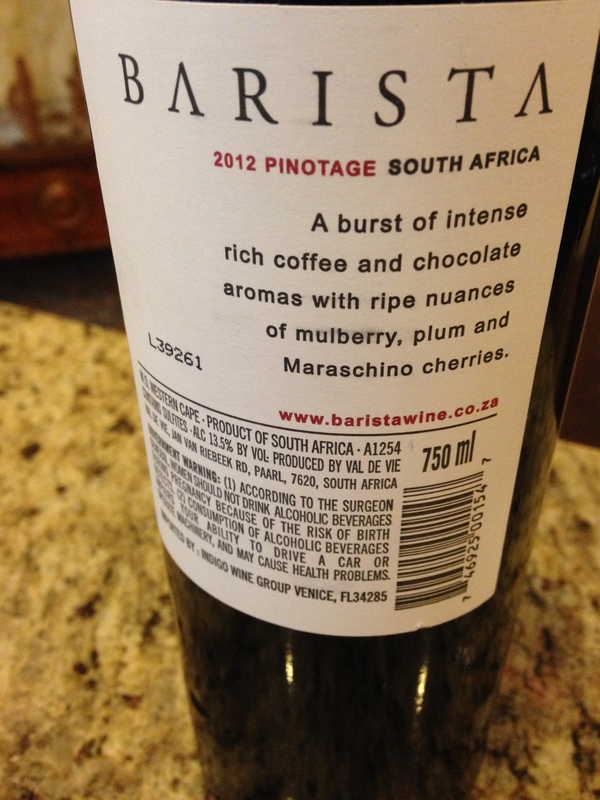 I came across a Pinotage I had never seen before — Barista (2012) Pinotage. The name itself does it justice — Barista — coffee. It also has the traditional notes of Pinotage with the smoke, subtle leather and some fruit. It was in the mid-teens, price-wise. If you’re looking for a looking for a new wine and/or are a fan of this varietal, totally try it (assuming you can easily find it). 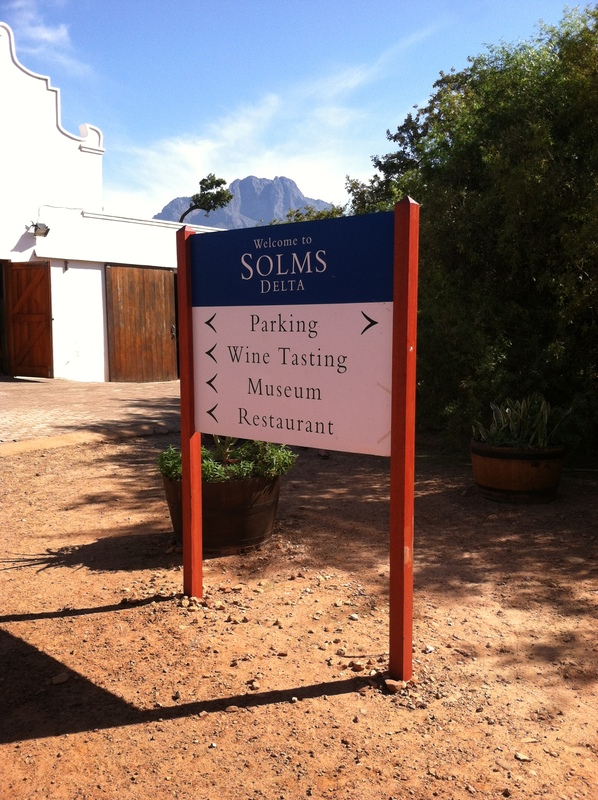 After the 2nd winery, we put the bikes away and took a long enough drive (as in too far to ride) to Solms Delta. Here we started with their Vastrap, a white which is a blend of Chenin Blanc and Semillon. It was a dry white, nothing to write home about. R50. 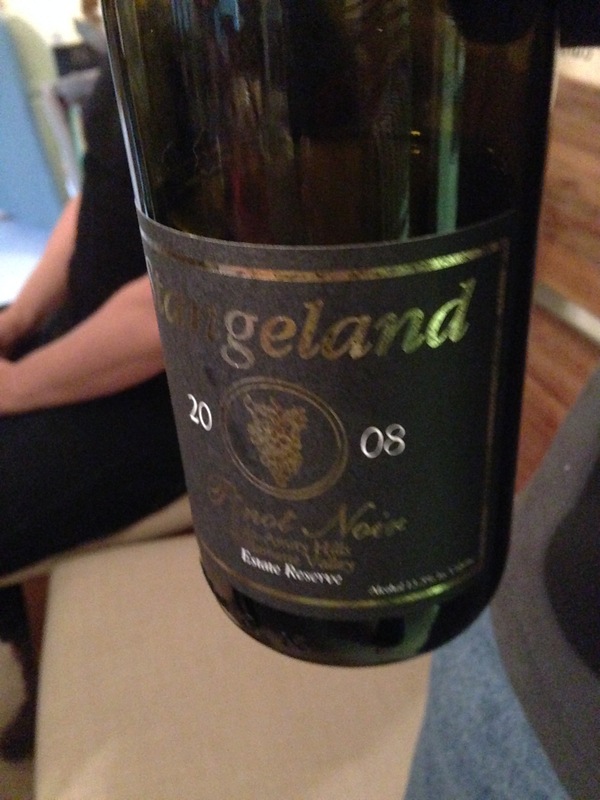 Next we went to the Amalie, which is a blend of Viognier, Roussanne and Grenache. Smells like chard, has some oak flavors, but I would characterize it as a ‘light’ chard. R110. 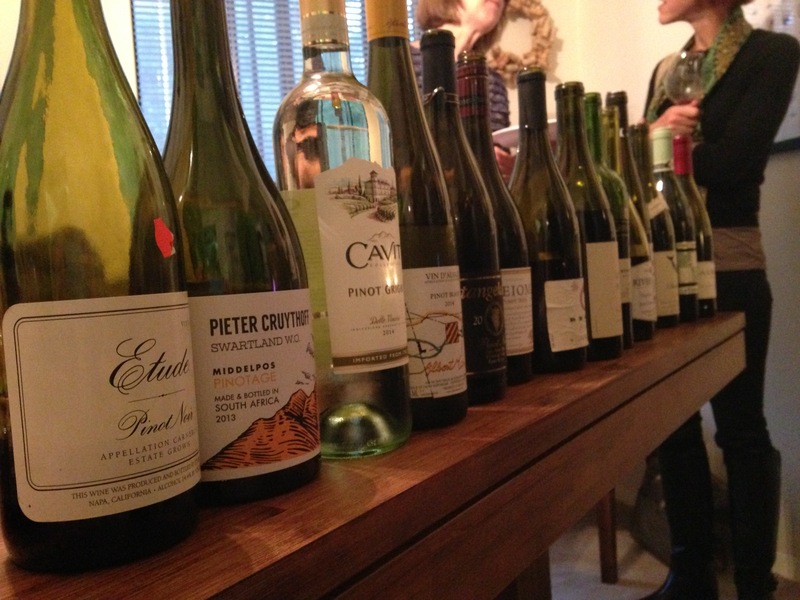 Third one presented was the Lekkerwijn, which means ‘nice’ or ‘yummy’ wine. It’s a blend of Mourvedre, Grenache Noir and Viognier and is a Rose. It was sweet and not great. R55. Reds, finally reds!!! Langarm, pronounced Long-arm, a blend of four varietals — Pinotage, Touriga Nacional, Shiraz and Mourvedre. The nose had tobacco and was sweet. The taste was light and peppery. R55. Next red was one I look for a lot and can be hard to find — sparkling Shiraz. This one is their Cape Jazz Shiraz. Subtle, fruity, per them. Light, refreshing, 9.9% alcohol. Yes, oh yes. I left with a bottle. R580. We then hit a fortified wine, the Gemoedsrus, made with a Shiraz grape. The style ‘An entirely new concept in port-style wine; Shiraz desiccated on the vine, then fortified with Shiraz grappa.’ 18.5% alcohol, NICE and SMOOTH. R150. Finally we sampled an experimental wine, Perry, a lightly sparkling pear fermented beverage, 6% ABV. Crisp and refreshing. The problem here is that you could not taste any alcohol so you could easily just be sitting outside enjoying this on a beautiful summer day and that bottle would be gone quickly…and you would be too…without realizing it. R50. Three down, and since we had such a small group, our guide made sure we hit one more winery before the day was done! To get to our 2nd winery, we only had to ride about 5K from the first. Not too shabby. Still very scenic! 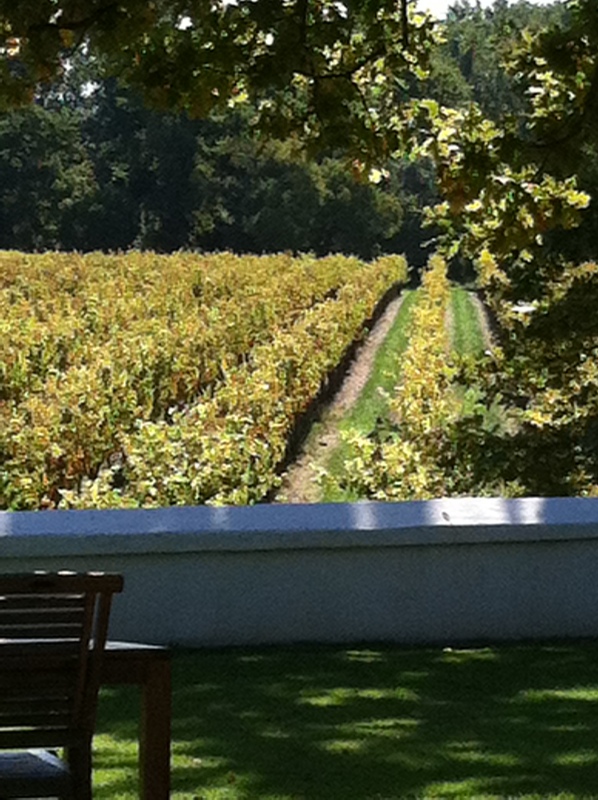 This next winery we visited was Franschhoek Cellar. 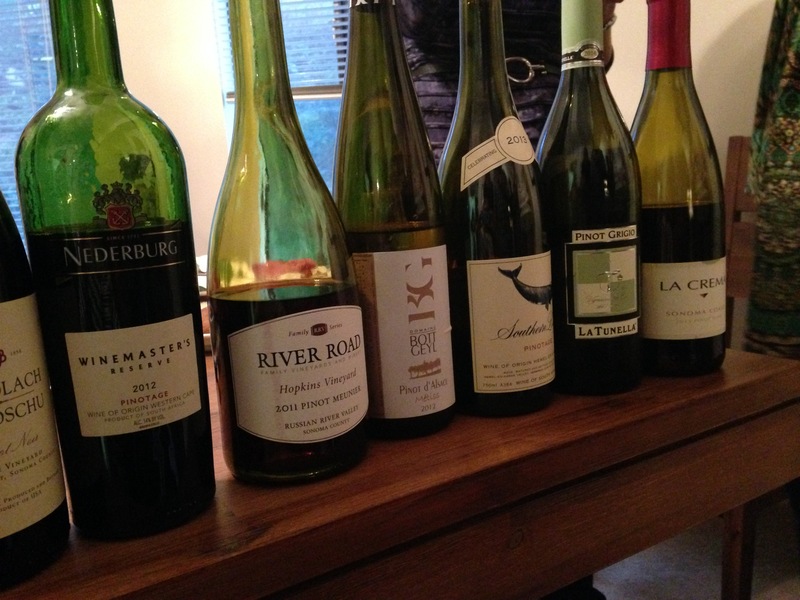 For the tasting, we got to pick six to sample from the entire menu (versus being given specific wines). That was great because between the entire three of us on the tour, we were able to taste almost everything! And off we went. Statue de Femme Sauvignon Blanc — In the top 10 last year. Light and crisp. Another typical SA bargain at R50. La Cotte Mill Chenin Blanc — Tropical, pineapple taste. R40! Really, $4 for a bottle. Love this place. Note on the dates on the back labels, they write day/month, versus how we do month/day. Club Hose Rose – a blend of Pinotage, Shiraz and Cab. The best way I can describe it would be powdery rose petals. GREAT!!!! R40. The Old Museum Merlot — Very berry-y. NICE, for a Merlot. There seemed to be quite a difference in SA Merlots. I don’t normally like them but down there they are quite unique! R50. Stone Bridge Pinotage — Nice, light and smoky, oh yes. R50. The Churchyard Cabernet Sauvignon – Thick, chocolate, tobacco are the best notes to describe this one. R50. Last but not least was a limited release. 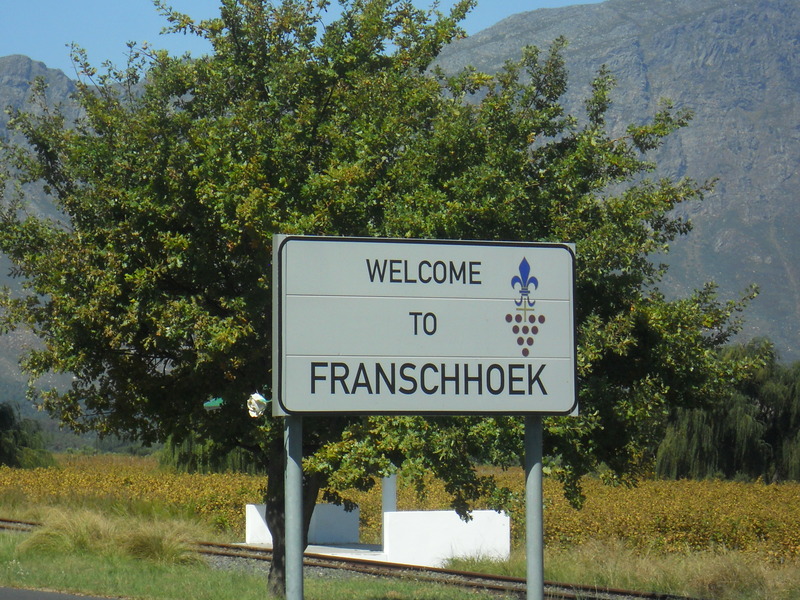 The Franschhoek Vineyards Shiraz, cellar door exclusive, no info about it anywhere except on the tasting sheet. “The Shiraz grapes for this wine are from one of the highest most rugged vineyard sites in Franschhoek with singular personality and expression that compelled our winemaker Richard Duckitt to go to great lengths to preserve the tremendous concentration and purity of fruit in this exemplary Franschhoek wine.” — ‘sweet’, thick and smooth. R100. Mid-way through this tasting after everything was poured, lunch was served and we were able to take our glasses outside to enjoy some great food and drink in the amazing weather. 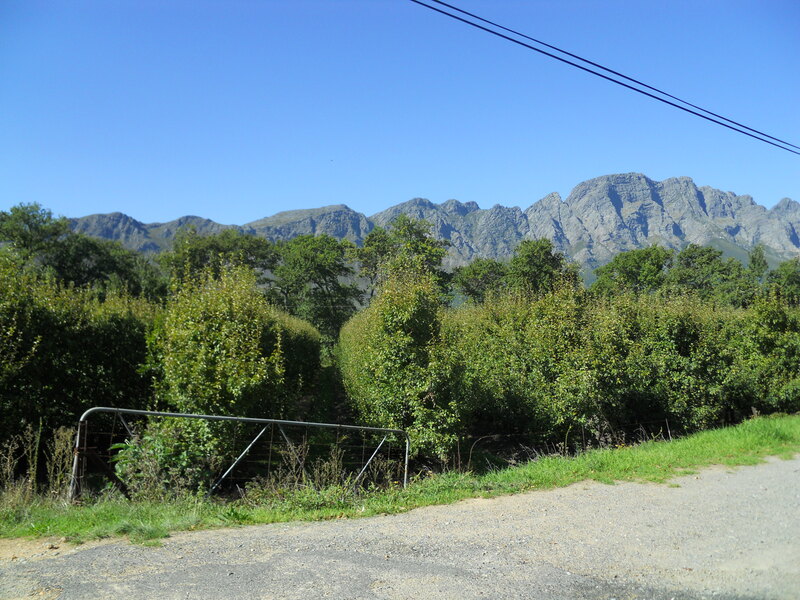 While in South Africa, one of the days was dedicated to a cycling winery tour. Sunny, 70s, paved and dirt roads, many grapes, heaven on earth! Our first winery of the day was Moreson. To get there, we had about a 12K ride from our starting point. Wine was in order! It was a beautiful outdoor setting with fountains, ponds, little rivers and just a great atmosphere. We were given a second round of bubbly, this time Solitaire Blanc de Blancs. I would describe this as green apples, sharp and crisp, NICE! Another steal at R110. We then progressed from bubbles to the regular stuff. Our first one was a white, the Dr. Reason Why Unwooded Chardonnay. Love the name! Though unoaked, there was a bit of light cream taste. R89. Round 4 of the tasting brought about another Chard, this time the Mercator Premium Chardonnay. The nose had notes of lemon, lime and toast. The taste — NICE! It had a light toast taste but not like a ‘true’ chard (to me — saying this as not a big chard fan). R168. Last but not least is what I love about South Africa the most — Pinotage. The sinful, powerful, delicious, perfect cross of Pinot Noir and Hermitage. Have your ever wondered how it came about? Here’s the quick history lesson on Pinotage. Thanks Wikipedia! 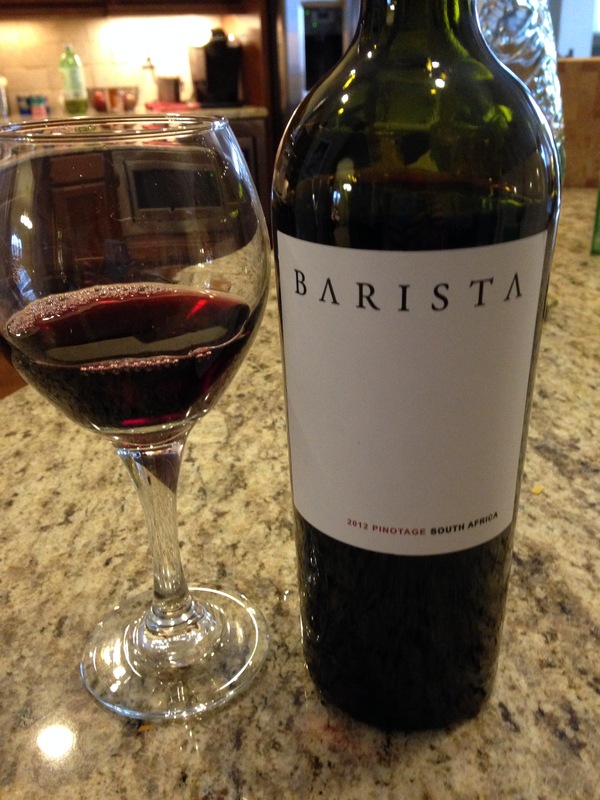 This brought out all the characteristics of the varietal I expected — smoky and smooth…ahh, what a pour! R168. This was a great start to the winery tour. Once done, we hopped back on our bikes to the next one…about 5K away. When at the store the other day something came up about South Africa, the word Pinotage came about and then next thing I knew we were being led to the California section?! Yes, oh yes. Apparently some vintners are trying to get that amazing grape over here. 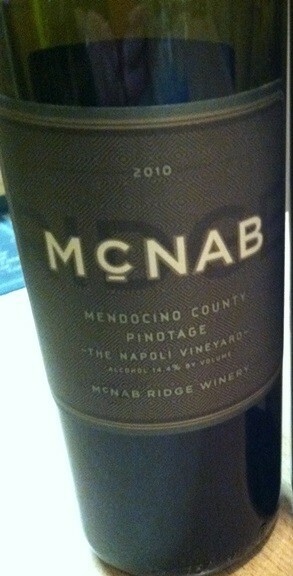 So we of course had to buy a bottle, from McNab Ridge Winery. It was quite unique. Not as smoky as South Africa, but still darn good. And when it finished, it was creamy, super creamy on the back on the mouth. Definitely worth trying! It was mid-high teens, dollar wise.